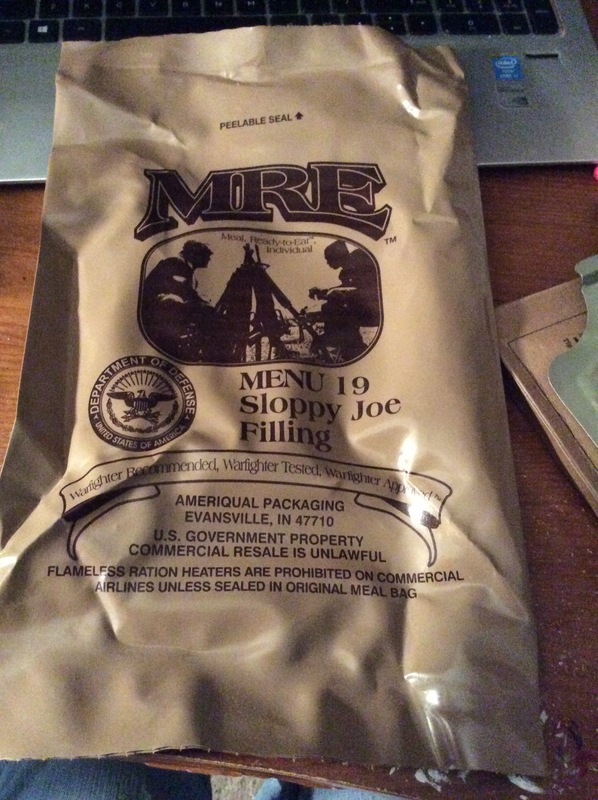 Today for the MRE Review Monday I have decided to try Menu 19 Sloppy Joe Filling. I’ve had them in the past, and I didn’t know what to expect. These are the things that come in the packet: The entrée Sloppy Joe Filling, brown spoon, carbohydrate electrolyte beverage powder in orange flavor. Apple sauce with raspberry puree, peanut butter, cheese filled cheddar cheese crackers, BBQ sauce packet, Apple Jelly, crackers, chemical heater, beverage bag for the coffee and creamer, matches, toilet paper, moist towelette, sugar, either laxatives or caffeine flavored gum. Salt and sugar. The Sloppy Joe Filling actually tastes pretty good nice and filling. I could not stop eating it either, and it did taste a little bit sweet. It’s just what a soldier needs on the field. The crackers tasted good with the peanut butter and apple jelly. The apple sauce was okay, and at least the cheddar filled crackers tasted like they just came out of the box. I’ve said this in my Youtube video, but I have not decided what the next MRE Review will be yet. I do have Monday. I’ll try to post more on the blog and film more videos. Most likely only Mondays during the school year. On winter break and Spring Break you will see more videos. I’ve yet to figure out a good software to use to record games for PC and on my Xbox One. I’ll find it eventually. I’m also using #NANOWRIMO to write the third Scarlet book. I really need to work more on that, and get out at least 8 books so it will take off. I want to write full time at this point. I can’t imagine a better job then writing books, reviewing books, and playing video games and filming them. Even if school is slow I need to write still anyway. I plan on giving some books to a publisher, and some I will publish on my own. I love giving out copies of my books, and seeing people’s faces when I do. I write for them and not the money. I have so many awesome ideas for my books. I can’t wait to show you more of my worlds. ← Big News on #TheKillerContractAgency Front!